During a six month experience in India, we worked closely with Craft Boat, a handmade paper company and design studio based in Jaipur, Rajasthan. 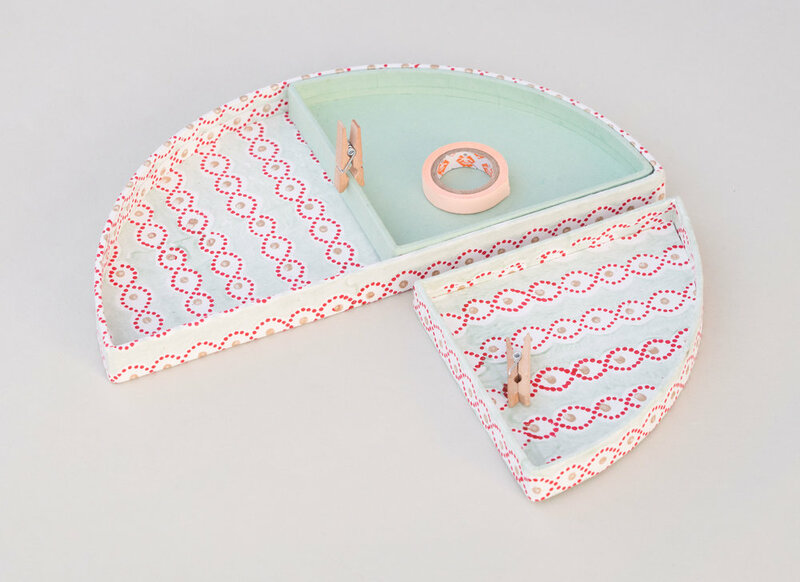 They specialise in designing and creating products using 100% cotton handmade paper, always beautifully printed with locally sourced experienced artisans. The paper they use is obtained from the mountains of waste cotton produced by the garment manufacturing industries, creating a paper with a unique texture and durability. 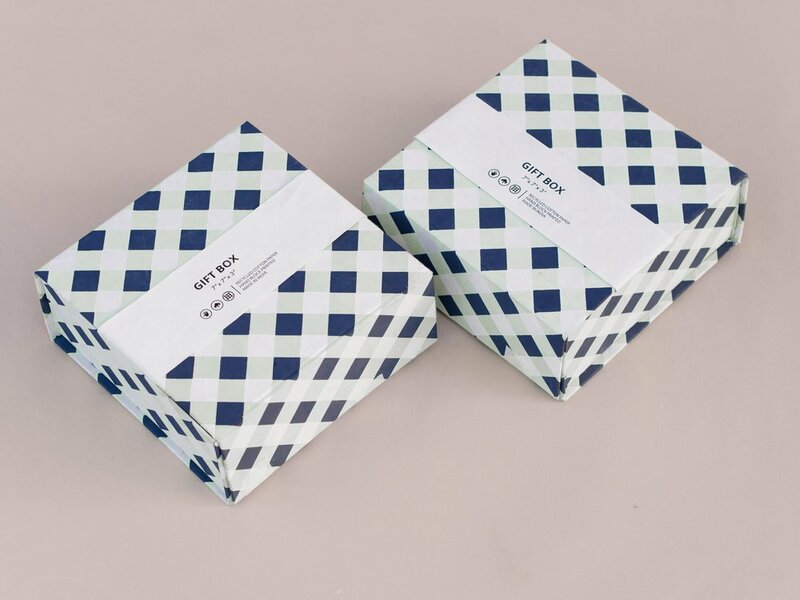 Last year Craft Boat commissioned us to design a collection of paper products, working on the product structure and colour scheme as well as the printed pattern designs for the surfaces. The experience was an insight into the world of recycled cotton paper. We had the opportunity to see how things come alive from the very first steps. 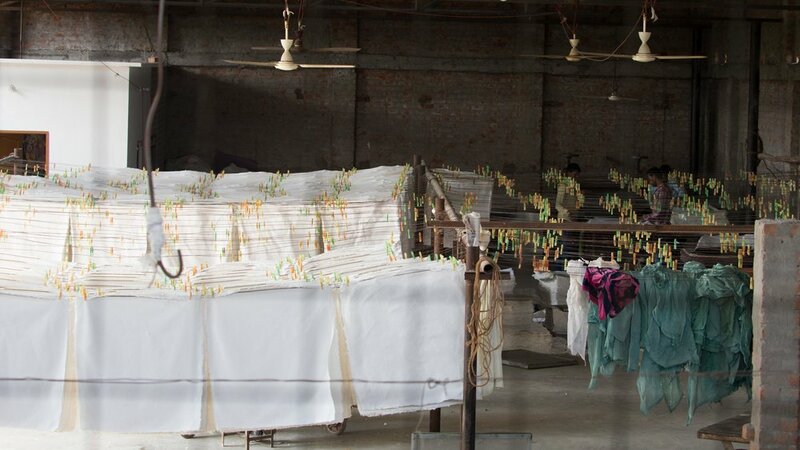 In Sanganer, an area in the south of Jaipur, there's a whole area dedicated to this industry that has fortunately survived through the mechanisation of paper making. The most beautiful aspect of this process is its sustainability: starting from the first material used, cotton waste from the clothing industry. Every small scrap of cotton is purchased instead of being dumped in landfill. Once acquired, this cotton is then trimmed through a machine that breaks the pieces in smaller bits and prepares them to be converted into pulp. The dry cotton is submerged into special water tubs that pushes the material into a pulp processor. The whole process takes up to 24 hours, after which the cotton has become a very soft and shapeless material, the cotton pulp. The cotton pulp is now ready to become a sheet of paper. This entirely manual process consists of two people raising the pulp from the water and pressing it between two sheets of cotton using two screens (see first image). This system allows the pulp to be properly levelled, drained of excess water and separated from the other sheets. Here, the paper acquires its recognisable stripy texture from these sheets of cotton, and each one has its very own unique texture, similar to a fingerprint. Once the pile of sheets is big enough and enough water is drained, all the cotton rags can be removed and the sheets can continue their path. They are hung singularly and left to dry. A main element of this project was designing the patterns, and understanding the various print techniques we wanted to use. We designed four different themes, each one with a different colour story. Each individual theme consisted of a coordinated collection of prints made with wooden blocks and one made with the marbling technique. 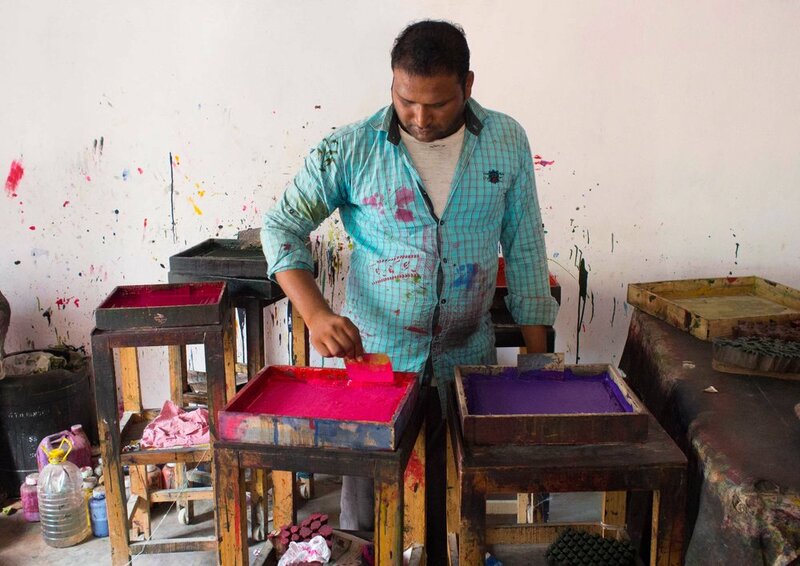 We visited a Block Print practice in Amer (north of Jaipur) and discussed with them the best way of making the prints work and colour matching. It is of vital importance to confront yourself with the artisans: they were our guides through the process, listening to their expertise, understanding what was possible, and when needed adjusting our designs. Sampling of colours and prints is vital before starting production. Inks and colours react differently to different papers, and blocks need to be tested to insure the pattern is transferring correctly. 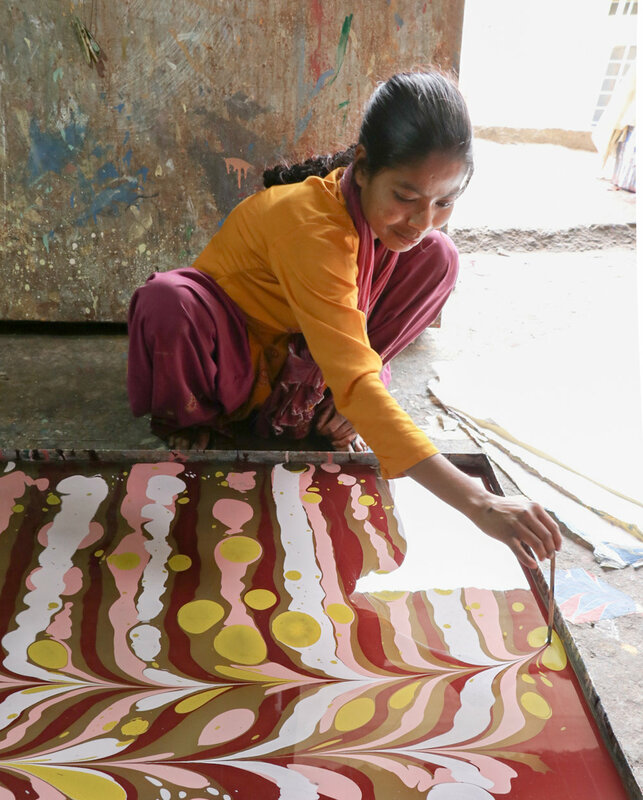 Every sheet of beautifully block printed paper is used to cover our products by skilled artisans that made each one of them completely by hand. Every product has been designed in its proportion and construction with a talented sample Master that guided us to the best way of achieving our goal. 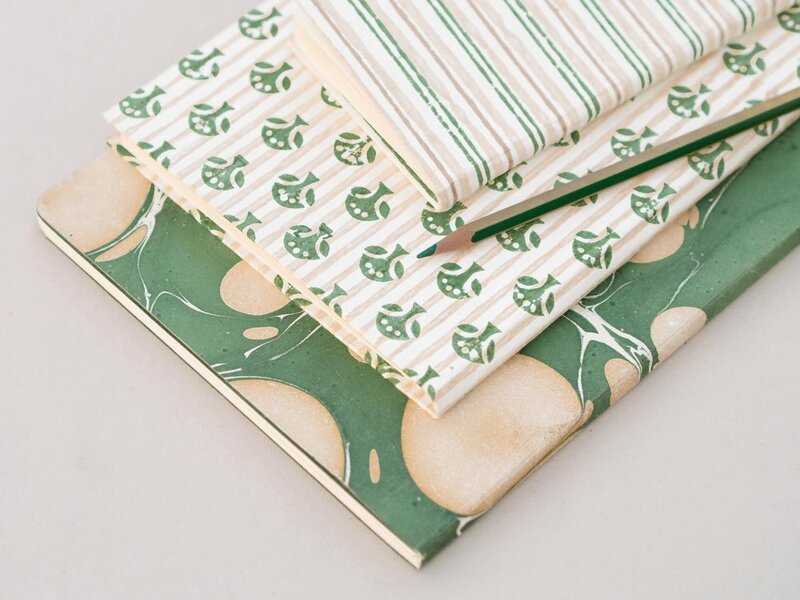 Hardbound and softbound notebooks, gift boxes, trays, greeting cards, gift wrapping material and storage containers inspired by traditional Indian pottery are the products made especially for this collection of prints. The feel of these objects is warm, the 100% cotton paper has a soft surface and the colours are vivid and textured. The four collections of prints have their own different feel, but they are all connected by one geometric element (the pointed oval), extrapolated from Kolam ornamental motifs. They've been paired with a geometric pattern and a hand marbled composition using the same colour palette. We were constantly amazed by the level of quality and consistency of the marbled sheets. The experienced hands of Raees, Anil and Mujeeb have been creating marble compositions and mixing colours for many years, enabling them to have complete command of their craft. And if you ever spot a marbled car (!) on the streets of Jaipur you know who it is.